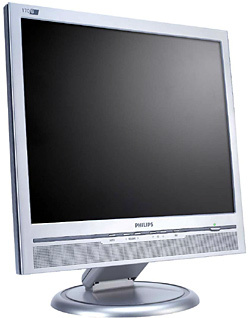 I was recently asked to recommend an LCD monitor to someone, I suggested the Philips 170B6CS 17″ inch LCD monitor. On-Off response time is the period required for a liquid crystal cell to go from active (black) to inactive (white) and back to active (black) again. It is measured in milliseconds. Faster is better: Lower response time means faster transitions and, therefore, results in fewer visible image artifacts in the display of transition of text and graphics. On-Off response time is not that important a measure for the display of business content like documents, graphs and photos but is crucial for LCD monitors used to watch movies (DVD, DIVX etc) or play demanding graphical games eg: First Person Shooters (FPS). Dual input provides connectors to accommodate input of either analog VGA or digital DVI signals. When connected to your video card via the digital DVI connection the LCD will display the image more accurately, however having analog VGA support means that you can still use the LCD monitor with computers that have old videocards with analog VGA (D-sub) connections. SmartManage is a system for monitoring, managing and checking status of display devices as well as delivering remote support to users who experience difficulties – all accomplished over a LAN. Lead-free display products are designed and produced in compliance with strict European Community Restriction of Hazardous Substances (RoHS) standards that restrict lead and other toxic substances that can harm the environment. Below industry average power consumption results in lower power bills for you 🙂 The Philips 170B6CS Complies with E2000, Energy Star and NUTEK standards and has power consumption of 33W when on and less than 1W when on standby. The embedded power supply built into the body of the Philips 170B6CS saves space by replacing the need for a bulky external power adaptor. Ergonomic design makes Philips monitors ‘people friendly’ with tilt, swivel and height adjustment so each user can position the monitor for maximum viewing comfort and efficiency. Note: the Philips 170B6CS is available in black or silver and comes with a VGA cable so if you want to use the DVI connection you’ll have to buy your own DVI cable separately.